We help you get better at understanding your insurance policy coverage: detailed tutorials, case studies and opinion pieces. Hail damage storms might not be the worst natural disaster that you can imagine happening to your property, but they can cause a surprising amount of long-lasting damage so you should be prepared in the event of a hail storm or associated weather event. How Do You Inspect Your Roof for Hail Damage? When to Call in a Professional Contractor for Your Hail Damaged Roof? When a hail storm hits your property, it can cause roof hail damage or the covering of your building(s) as well as other property. Vehicles left outside, aluminum siding, asphalt shingles, and the gutters along the roof can all be negatively affected by hail. First, you should know your enemy. Hail is a form of precipitation that forms during thunderstorms when upward air currents or updrafts bring raindrops into the higher-level clouds, where the temperatures are below freezing. This causes tiny particles of ice to gather around items in the air like ice crystals, specs of dust, frozen raindrops, or any other tiny nuclei that might be floating through the air up there. The ice particles then drop back below where the temperatures are above freezing, picking up more moisture from the rain and water vapor, growing in size. Then the nascent hailstone gets caught in another updraft, freezing again. The more powerful the updrafts and storm winds, the longer the hailstones circulate back and forth until gravity does its job and they drop to the ground, causing damage to rooftops, vehicles, and anything else in their path. Any type of hail can potentially cause damage to your property, but it is typically thought that 1-inch or larger stones have a greater negative impact on single layer roofing systems, while roofs with multiple layers of shingles may face greater problems from smaller hailstones since they usually have a softer support area underneath the top layer, allowing the tiny stones to penetrate the surface. If you don’t worry about hail storms in the same that you worry about more spectacular natural disasters like tornadoes or hurricanes, you should know that hail storms are more common – and costly – than you may think. According to the National Oceanic and Atmospheric Administration (NOAA), the United States experienced over 4,000 hail storms in 2018. And what’s more, if you live in a state like Colorado – sometimes referred as “Hail Alley” that has suffered three of the most expensive eight hail storms during the past three years resulting in over 100,000 roofing hail damage insurance claims, then you need to be especially prepared to recognize the potential damage to your property and how to fix it. But note that Colorado is hardly alone – nearly every U.S. state has experienced significant hail storms; in fact, Texas actually had more hail damage insurance claims regarding hail damage during any previous year. Overall, hail storms are a fairly regular happening in many parts of the United States. In 2017, there were over 6,045 recorded hailstorms, and we’re on track to receive approximately the same number or more in 2018 with nearly 4,000 reported instances of hail so far this year. All of these facts and stats make it clear that you’ll need to be particularly knowledgeable about what your insurance policies and what they cover in the event of a hail storm or similar major weather event; not every policy covers hail damage on roof and if you live somewhere where that damage could be significant, than you need to thoroughly research your insurance options and of course, ask your public adjuster if you have any questions about your coverage and what you need if you live in a region prone to hail storms. Hail storms can cause a wide range of damage to your roof and your property in general; even seemingly minor hail storms can cause significant problems that you might not notice until the damage increases over time and creates leaks that may be harder to repair or even require a replacement roof. While your first concern during a hail storm might be protecting your family or employees, your property, and any vehicles that you have outside (which is definitely a valid thing to worry about), immediately after the storm is over and things are secure, you should also consider the state of your roof. This includes how to inspect it for damage and make any potential minor repairs or efforts to protect the damaged spots until you can get estimates from a roofing contractor – or multiple contractors so you can compare costs – so your insurance can see that you attempted to mitigate future damage until the roof can be repaired or replaced. Being without power, having hail damage siding and rooftops, and associated water damage or flooding can cause additional damage long after the storm is over – and that ongoing damage can affect your roof insurance claim if you don’t take immediate steps to mitigate it. If you’re recently experienced a significant disaster like a hailstorm, you should take the following steps to check out your roof and determine if you need to make any repairs or hire a contractor to do so for you. When hail hits your home or commercial property, and the amount of damage can vary greatly. Wind Damage. The speed, intensity, and direction of the wind during a hail storm can vary greatly, which can affect the severity and location of the hailstones. Size of the Hailstones. 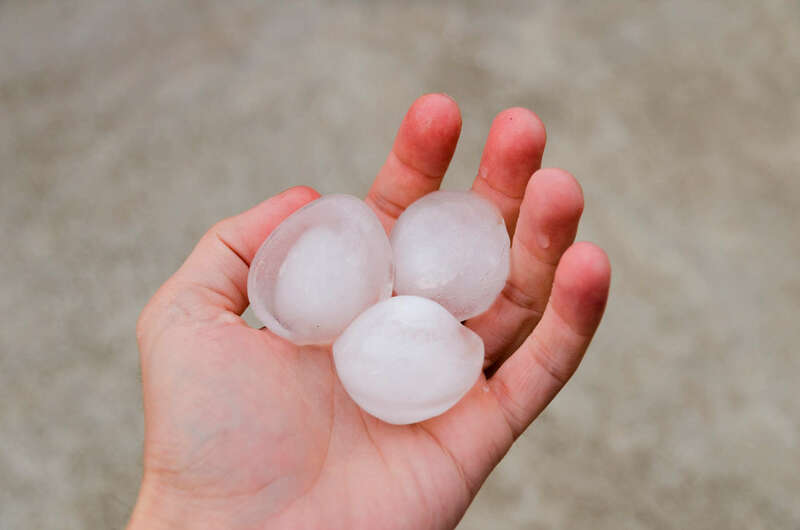 The size of individual hailstones will impact the degree of damage, and keep in mind that hailstones can be as small as a pea or as large as your softball, or anything in between. Density and Shape of the Hailstones. Some hailstones can be denser than others, depending on the atmospheric conditions in which they are formed. They also tend to not have smooth edges, which affects the level of destruction that can cause damage to your roof, your siding, gutters, and other aspects of your property. Type of Building Materials Used. Every type of building material will absorb and respond the impact of hailstones differently; for instance, hail can crack vinyl siding and cedar wood shake roofing, or cause dings or dents in asphalt shingles, gutters, or aluminum siding. 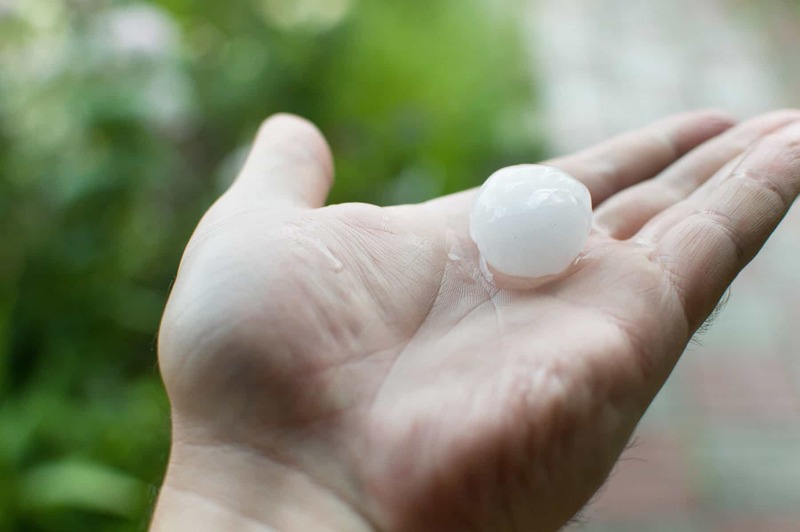 Particularly large hailstones can even be strong and dense enough to puncture a roof, particularly if it is older or weaker – the age and condition of the roof will affect the degree of damage that a hailstorm may cause. Physical Barriers to the Hail. From natural barriers like tree cover or other landscaping to neighboring structures like fences, adjacent buildings, or other structures, the barriers located around your property and the roof may protect against the impact from a hail storm. Now that you know what factors can cause hail damage to your roof and your property in general, you need to identify the actual weak spots and problems. There are a number of ways to inspect your roof for leaks in general and hail damage in particular. Keep in mind that the most important thing is safety first! If you’re planning on going up on your roof yourself, make sure that you have a good pair of soft-soled shoes or even get some roofing boots, make sure that your ladder is in ideal working condition (and get a buddy or co-worker to hold on to the bottom for you as you are climbing up and down), and bring your camera and some chalk to mark the spots you think are damaged. 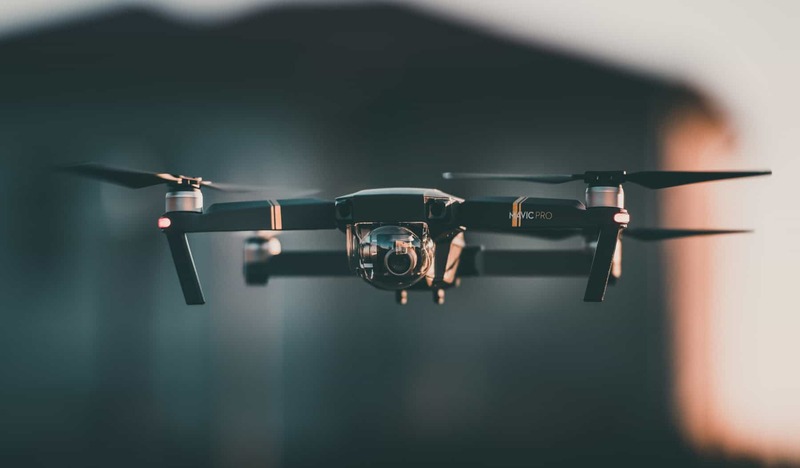 If you’re really tech-savvy and love your gadgets, or have a friend who does, you can use a drone to assess your roof for hail damage. That will allow you to take pictures and videos from angles that you couldn’t normally see from climbing up on the roof yourself, which can be dangerous in general, but especially if you don’t have a building repair or construction background. Of course, keep any local regulations about flying drones in mind and only fly a drone in clear weather. You can start things out on the ground, by looking for dents in the gutters, gutter screens, or downspouts. 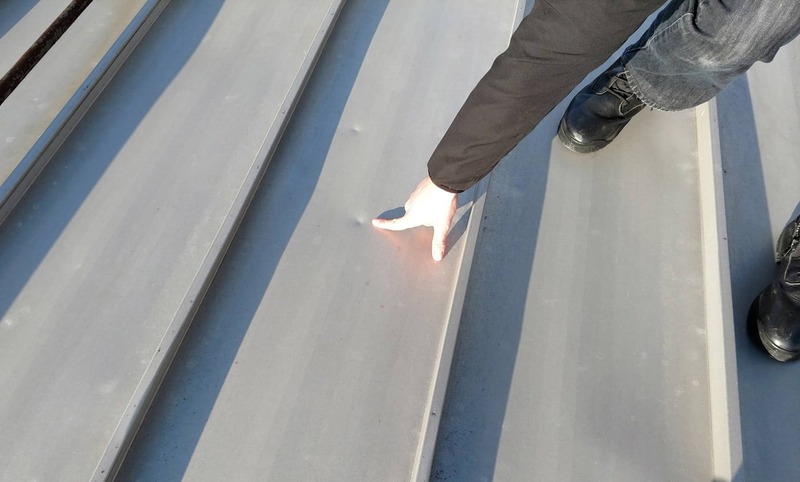 While problems in these areas as a result of a hail storm is not always the case, chances are that if there is hail damage to the top of the roof, there will be some impact to the gutters. Keep an eye out for even small impact areas, since that will help you predict the health of the top portion of your roof. 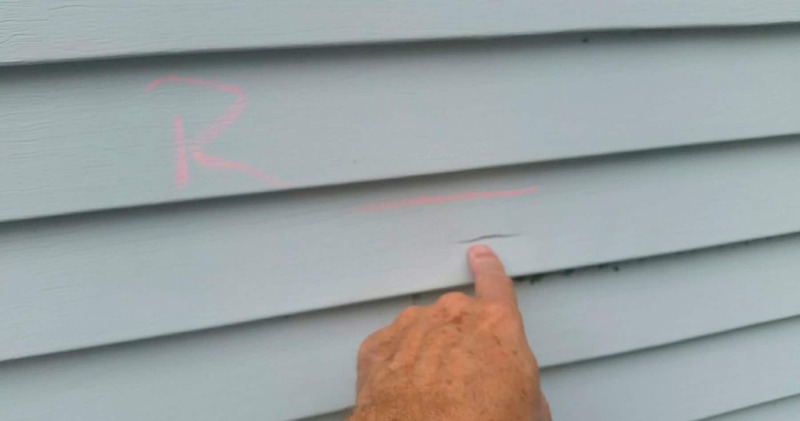 Next, look for hail damage to your siding and the window sills and window casings, along with any other exposed metal surfaces such as the metal fascia on the roof eaves. Any dents, dings, or other signs of hail impact – even minor ones – may be a sign there is more damage up above; also, remember that hail storms generally involve high winds so hail is nearly as likely to hit the side of the building as it is the top. Then inspect other outdoor elements of your property. Items like air conditioners often experience some damage during a hail storm. In addition, a damaged air conditioner may qualify for replacement under your insurance policy – and it’s good to fix it early before you’re looking at air conditioner failure during the hot days of summer. 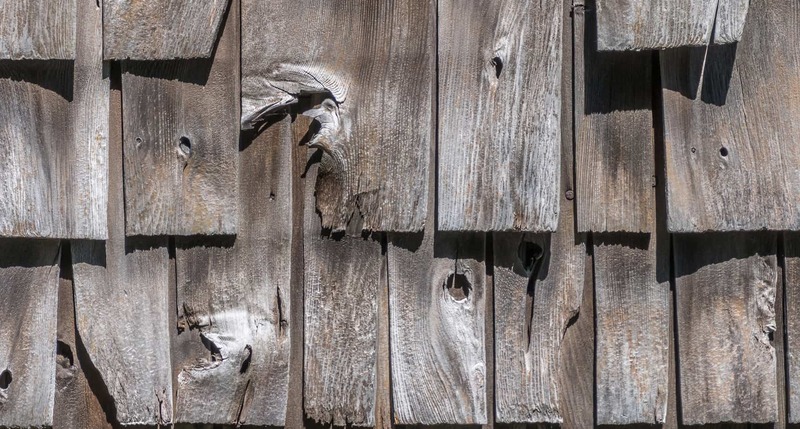 You should also inspect any exposed vents, sheds, patio covers, porches, mailboxes, and decks or other painted wood surfaces, and note that insurance may cover these damages. Chipped or scratched paint beyond the normal wear and tear may be another sign of hail damage. Look for torn screens on windows and doors, dents in metal doors (usually garage doors), and hail damage on your vehicles and other cars or trucks nearby. Other things to check out include damage to outdoor furniture, swing sets or play sets, debris and damage to outdoor swimming pools or fallen tree limbs around the neighborhood, and damage to plants, grass, bushes, or flowerbeds (particularly if some of your foliage looks shredded). Hail spatter on the driveway is another indicator of hail damage to the rest of the property, including the roof. These spatter marks are lighter spots on the driveway, sidewalks, parking lots, or other concrete surfaces, and they occur because the impact of hailstones can remove dirt, dust, algae, grime, or other small bits of debris from these surfaces, essentially exfoliating them in spots. Finally, check out the surrounding neighborhood for roofing contractor signs on the lawns – if your neighbors are getting their roofs inspected or repaired, chances are that you need to need check out your roof as well. After you’ve inspected things on the ground, next it’s time to get up on the roof and check out the shingles as well as the vents, chimneys, chimney covers, skylights, and any other features. One quick tip – if you’re having trouble spotting potential damage on harder or more reflective metal surfaces, chalk will come in handy – just run your chalk sideways over the surface and the potential hail damage will show up more clearly. It’s a little easier to spot the damage on rougher spots like shingles. In the event of a major natural catastrophe like a hail storm, you probably already know that you need to check out your roof for possible damage and leaks. Moreover, if you’ve noticed some of the more minor signs of roof leaks that may be related to hail damage then you need to examine things further and determine the next steps regarding your potential roof leak and repairs, and possibly call in the experts for help. There are certain signs you should look out for if you think that you’ve experienced hail damage to your roof or your property in general. We’ll describe the signs below for the various common types of roofing systems below. Finally, you’ll want to inspect the shingles. If you have a shingled roof, then it is damage to the shingles that is the most important part of your hail damage roof insurance claim and extensive hail damage is what earns you coverage for a roof replacement or major repairs. 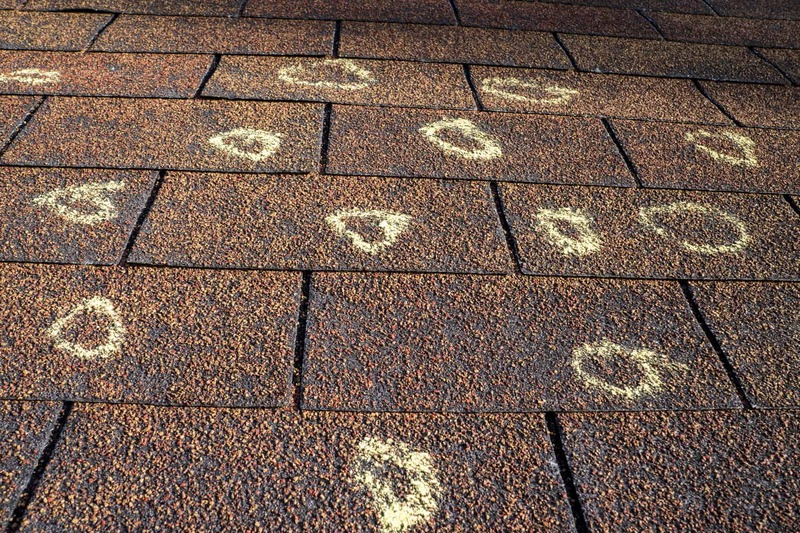 It’s important to understand that various types of shingles can react differently when hit by hail. Hail damage to asphalt or composition shingles need to be reviewed and inspected dissimilar ways as compared to wood shingles or other types of roofing surfaces, for one example. Hail Damage to Asphalt and Composition Shingles. If you are looking for hail damage on these types of materials, you should be trying to find random damage with no clear pattern, black or extremely dark dings or dents that are soft and feel similar to bruised fruit, missing granules that may even expose the felt or roof membrane, or asphalt or roof mat that appears to be shiny. Hail Damage to Wood Shingles. If you have wood shingles or wood or cedar shakes, you should also be looking for random damage with no particular rhyme or reason, splits in the shingles that are brown or orange in hue and have sharp colors or edges with little to no deterioration. There will likely be impact marks, dents, or other damage along the splits like the roof hail damage picture below. Large hailstones can even crack through these types of materials instantly. Concrete, Clay, Metal, And Other Dense Materials. These and similar types of roofing materials can also be cracked instantly during a hail storm. Determining if the shingles on your roof have been damaged during a hail storm can be really obvious, but it can also require the trained eye of an experienced inspector and a simple hailstone damage roof inspection. Major damage is usually pretty apparent – the surface granules are loose or gone, and there may be a developing hole in the roof. However, if even just a few granules are gone, you should still be concerned because greater issues may develop down the road. It takes a strong impact to knock the granules or other surface materials off a shingle, they are extremely sturdy. You might ask, what does hail damage look like on a roof? 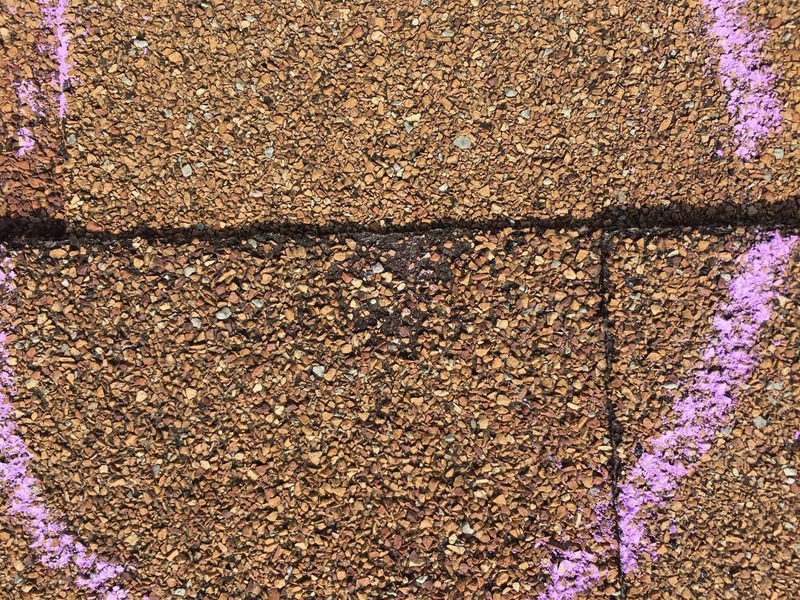 If even a few granules are knocked off the rooftop, that means the integrity of the shingles might be compromised, which means a water leak might develop over time. You may think that what’s the big deal if a few granules come loose?? There’s not a hole in the roof! Again, you may be surprised at the sheer amount of force it takes knock the surface materials off of a shingle. And larger hailstones fall at the rate of one hundred miles or more hour – now that’s a serious impact! When missing or impaired surface materials are found, then the integrity of the shingles has been compromised, and a water leak can develop over time as water pools in the weak spots during rainstorms and other weather events – even if everything seems fine at the moment. 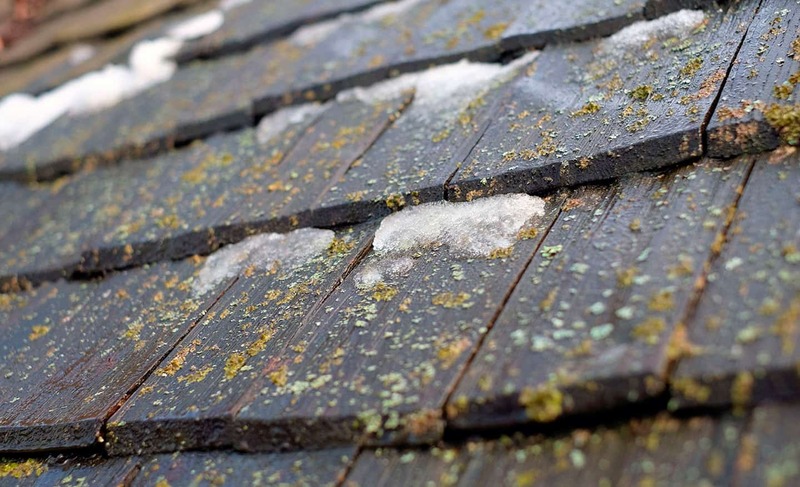 In the longer term, curled shingles may be indicative of hail damage, along with algae and moss growth where water may be leaking in or pooling in the cracks caused by hailstones. 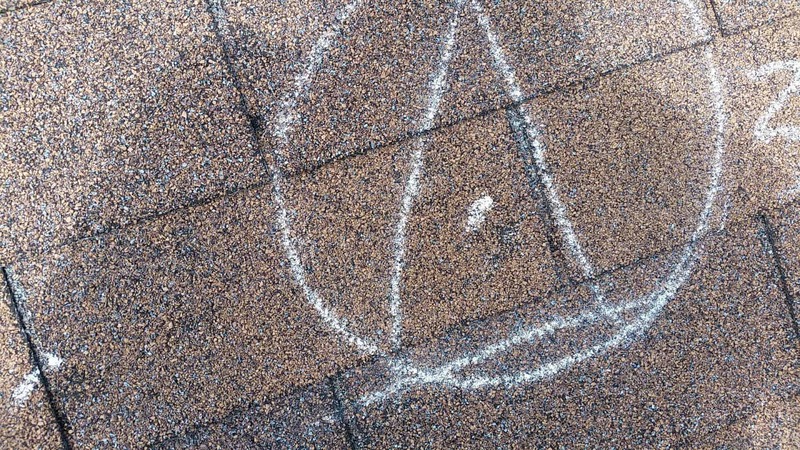 Even the smallest hail impact on a shingle can lead to a roof leak or other significant future problems that compromise the long-term value and safety of your roof, especially if you experience another storm or significant weather event before having the roof inspected and repaired if need be. Therefore, even if you don’t think your shingled roof has experienced serious damage from a hail storm, it is worthwhile to get it inspected, especially if you notice other areas or properties close to yours. That’s one of the reasons why it’s important to check your whole area or neighborhood, even if everything seems fine with your individual roof. Shingles might be the trickiest type of roof to assess for hail damage; but metal, clay, and slate roofing can also be difficult. Clay and slate roofs will usually have cracks or gouges when the stones hit, while metal roofing will show dents from the impact of the hailstones. Particularly soft roofing systems may experience punctures from larger hailstones. Be aware that while dents and dings will be more readily apparent on softer metal surfaces, you can use chalk to uncover damage on harder metal roofing surfaces or metal features like chimney vents – just run your chalk sideways over the surface and the potential hail damage will show up more clearly. Not everything related to hail damage is on the outside – there are a variety of things that you may notice inside your home that might not appear to be related at first. 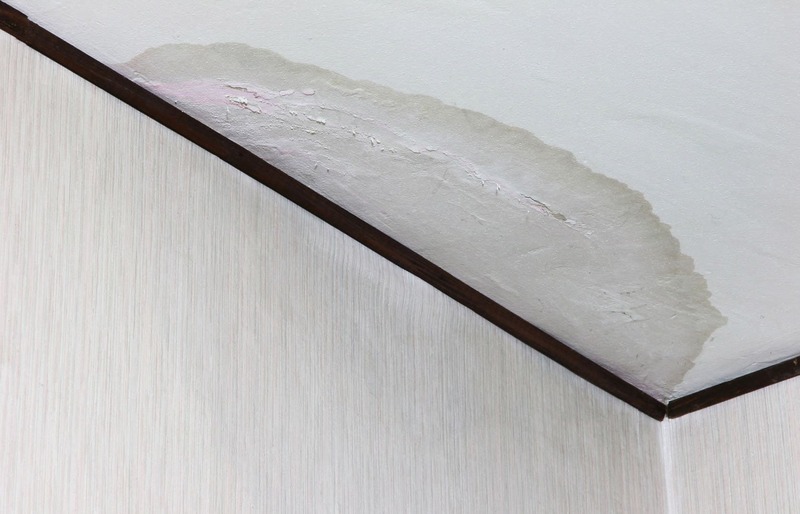 If you notice things like new water stains on the ceiling or interior walls, discolored walls, water stains in or around light fixtures, water stains in closets, mold or mildew on the walls, water seepage in the attic, wet insulation, or similar issues, then you need to check out the roof as well. This goes doubly important if you begin to notice these things soon after a major hailstorm or heavy storm. Keep in mind that there are many other types of damage or issues with your roofing system that are easy to mistake for hail damage. Things like exposure to inclement weather (minus the hail) or intense sunlight causes shingles to become brittle and may lead to an aged or weathered experience. Blistering, cracking, granule loss, flaking, and mold or algae – depending on your local environment – can all be confused with hail damage. These types of damage are normal wear and tear to the roof, but they may be confused with hail damage if you’ve recently experienced a hail storm. What’s more, manufacturing defects and other imperfections may have occurred during the installation process. Always have a professional inspect your roof if you have any questions, and contact your public adjuster if you believe you have sustained damage from a hail storm or other weather event. Note that the cause of the damage may affect your insurance claim so it’s important to understand the source of the issues with your roof before you make a claim. If you’ve inspected your roof and found damage to the shingles, the membrane, or any other part of your roofing system, then the next step is to inspect the roof yourself or call a contractor or inspector to help you out (or both). Know that the severity of the hail damage to your roof depends on a wide range of factors, including the type of roofing materials, the slope of the roof, the age of the roof, and the quality of construction. The level of damage and therefore the potential insurance claim also depends on the velocity of the hail, the angle of its fall, the hail size, hail density, and hail shape. The amount of hail damage to your roof may also be related to the number of shingle layers, if you’re dealing with a shingled roof. The second, softer layer of shingles is more prone to damage since the underlying surface is less supportive than the denser wood on the top. Hail damage can be described as either functional or cosmetic; functional damage is hail damage that affects the overall integrity and potential longevity of the roof and shingles, and perhaps the capability to even use or inhabit the property safely. On the other hand, cosmetic hail damage may not be pretty, but it doesn’t affect the functionality or long-term health of the roof. It is essential to determine what type of damage your issues are classified as, since the American Association of Insurance Services introduced a “Cosmetic Damage Exclusion” which paves the way for insurance companies to avoid paying out claims for mere cosmetic damage. That said, if your roof is actually functionally damaged the insurance company and their inspectors may attempt to claim that it is only cosmetically damaged in order to avoid coverage. 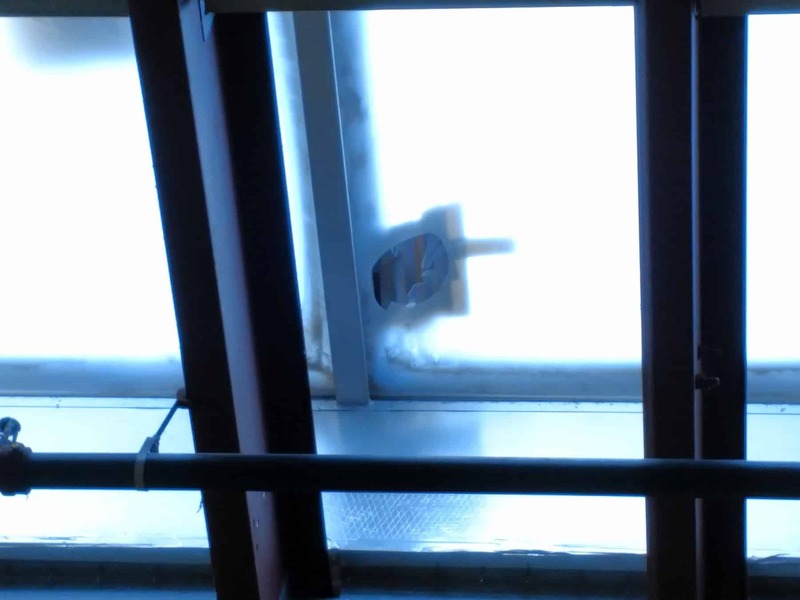 This is why you need your own public adjuster and their team of roof inspectors, contractors, and other professionals to make sure that you get the payout you deserve. If you aren’t sure if your roof needs repair work or you aren’t comfortable performing the repairs yourself, that’s when it’s time to call in a professional contractor and talk to your public adjuster about getting it covered. 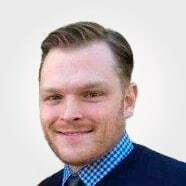 You may also want to consider your insurance coverage and how the policy is worded regarding fixes that you may perform yourself as an amateur versus repairs done by an official professional. Know that a professional contractor will have their own liability insurance in case anything goes wrong as well, so errors you make may be harder to get covered or more complicated to fix in the future. And if you have any questions about the process of fixing your damaged roof after a hail storm or other weather event, you should call your public adjuster – they are your best advocate and can help you navigate the tricky areas of not only dealing with a hail damaged roof, but help to ensure that the repairs or replacement roof and any associated damage is covered by insurance if and when applicable. If you suspect that your roof has sustained damage from a hail storm, the first thing you need to do is inspect the roof for dents, dings, split shingles, and any leaks, and cover any damaged areas with a tarp or similar waterproof material to show the insurance company that you made initial efforts to mitigate the damage. Take pictures and videos of everything you find, and hopefully you have previous documentation of the state of your property before the hail storm. As any public adjuster will advise, you should be regularly documenting the state of your property so you can provide evidence of the state of your property including your vehicles and any other outdoor assets prior to a disaster and compare the before and after images for your claim. It’ll make it easier for everyone involved to assess the extent of the damage and make it more difficult for your insurance company to claim that damage previously existed prior to the hail storm or other disaster. Get estimates if it is determined that repairs or even a complete replacement is needed. Know that many insurance companies will require a certain amount or rate of hail damage; for example, 8 plus “hits” or damage spots on the roof with a 10-foot by 10-foot square area on at least three separate spots on the roof in order to cover the costs of a new roof. 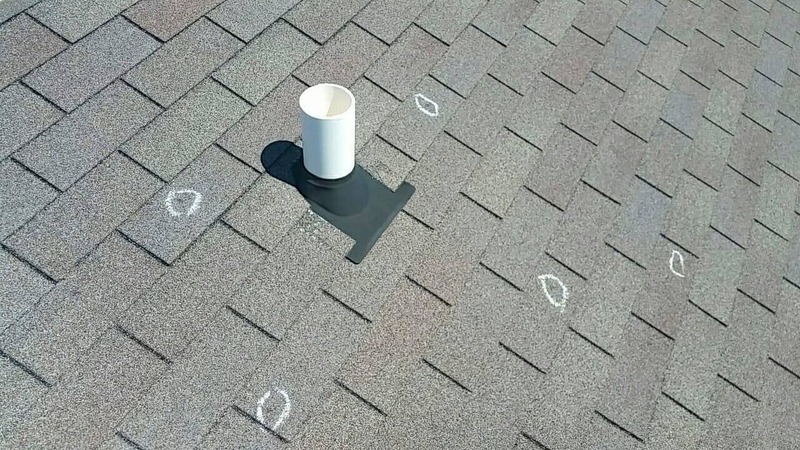 If you are inspecting your own roof to start with, you should use some chalk to mark each damaged spot so the actual inspector or contractors you are working with can find them, and take pictures or video as well. These images will be especially helpful for your public adjuster. Note that your safety is paramount and you should never start making these small repairs or climbing up on your roof until the hail storm is over and you’ve ensured that the area is secure. If you’re not sure, you should wait and contact your public adjuster and they’ll help you find professionals who are familiar with hail damage and other issues that can occur after hail storms. Of course, the type of payout you can get varies by the type of roof, your insurance policy, and the extent of the damage in each spot. This type of knowledge and assistance is where your public adjuster can be particularly valuable. They can help decide whether there is enough damage to make a hail damage claim on your roof. Also, be on the lookout for storm chasers or contractors that show up immediately after a major hail storm or other event looking to help property owners repair their roofs, siding, and other property. While many of them may be legitimate and just trying to get some business, you should never make repairs without getting a proper estimate and speaking to your public adjuster about the associated hail damage insurance claim. Know that you don’t always have to accept the first estimate from your contractor or the first offer from your insurance company – and your public adjuster can help you figure everything out. After working with your public adjuster to file a claim, you’ll want to contact some experience contractors to give you estimates for repairs or a possible replacement roof. They will help you find experienced ones who can give you estimates for repairs and help to determine how much work needs to be done, or whether the roof needs to be completely replaced. The contractors and your public adjuster will also help develop a timeline for repairs so you know how long it’ll be before you can fully use your property again. Your adjuster will also work out a timeline for potential payouts so you can figure out your finances accordingly; also keep in mind that you may be able to recoup some interim costs if your home or commercial property is uninhabitable for a period of time (generally in the case of a complete roof replacement). If you’re read this far, then you know that if you’re dealing with hail damage to roof, then one of the first things that you should do is inspect the roof (or have it inspected) and locate the damaged spots and assess the extent of the damage. Then inspect your insurance policy and call your public adjuster to find contractors, get estimates, and plan the next steps. Again, if you are not comfortable with clamoring around on your rooftop or in your attic, then you can call in professional contractors and inspectors. Concerned about paying for the repairs or how to bill your insurance company or contractors? That’s when you should call your public adjuster. 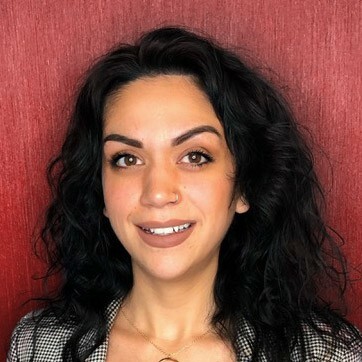 They are there to be your advocate and they are always on your side with your best interests in mind, as opposed to the insurance company which is seeking to pay out the least amount possible. Hail storms and the resulting damage to your property can be extremely stressful – but your public adjuster is here to help. In addition to all the aforementioned possibilities of functional or cosmetic damage to your property due to hail storms, a recent report out of Colorado Springs proves that there are far bigger threats from hail storms. Hail can damage your roof vents, causing dangerous and even potentially fatal carbon monoxide leaks. There’s been a rash of carbon monoxide calls in this hail-prone part of Colorado, and the Colorado Springs fire department states that this is due to the severe hail storms the area has experienced. 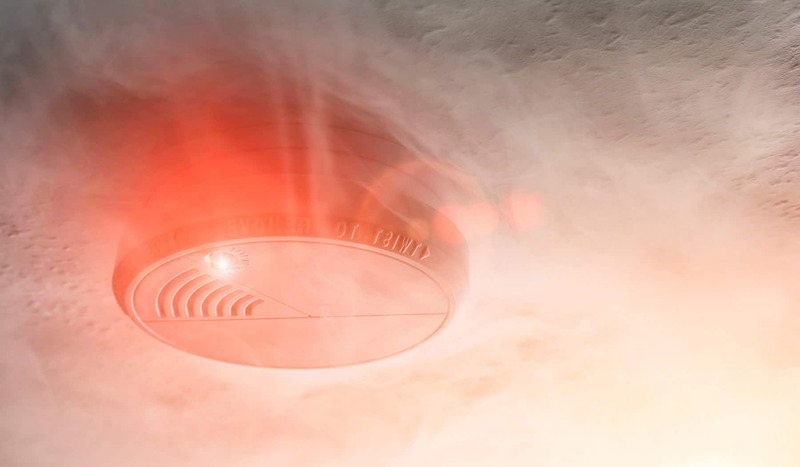 These calls responding to the “silent killer” are some of the most dangerous for firefighters to respond to, and they’ve been called to over one hundred potential carbon monoxide leaks in 2018 alone. Not all hail damage will cause carbon monoxide leaks, but the experts say these are just examples of why you’ll want to take a look at your roof vents immediately after a hail storm, according the article. The local building department inspectors now wear these personal carbon monoxide detectors on the job to help them discover major problems where lines are blocked or unknowingly disconnected allowing the toxic gas to leak into people’s homes. You should always have carbon monoxide detectors in your home, but it’s especially important to check on them regularly and make sure they are working properly – especially after a hailstorm or similar weather event. I agree with you that hail damage a cause long-lasting damage to your roof, and I’m pretty sure no homeowners want that. I like it when you discussed the whole framework of hail damage, it’s repair cost, it’s effects, etc. If ever that my house will experience any instances of hail damage in the future, I will definitely follow your suggestions as a guide and find a professional roofer to fix it. Excellent point, Bree. Thanks for the read. Since 2010, Paramount Loss Consulting has successfully negotiated large loss claims all over the US for REITs, commercial property owners, risk managers, facility managers, contractors, and more. Sign up for the Paramount newsletter to receive up-to-date resource guides, insider tips and insurance news.